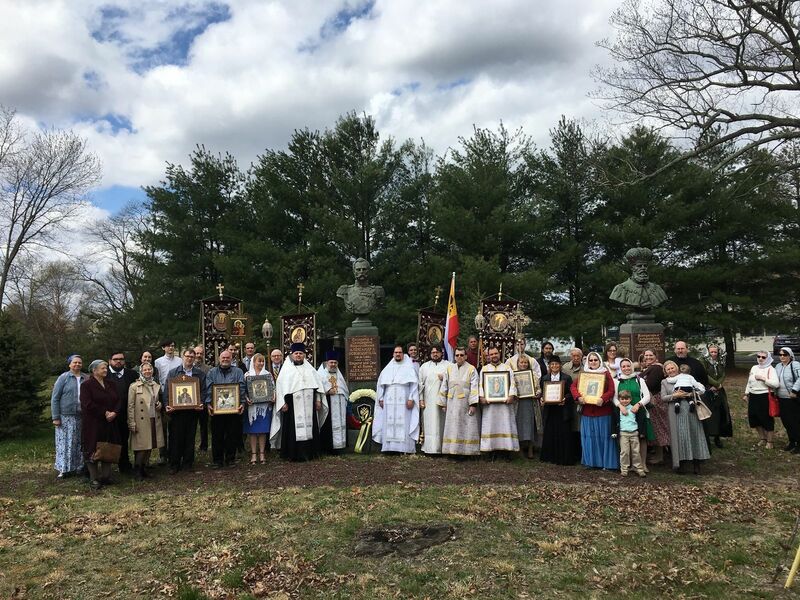 On Sunday, April 29, the 200th anniversary of the birth of Russian Alexander II "the Liberator," a commemoration event was held in Howell, NJ, honoring his bicentennial. The event was a cooperative effort between the Representation of the Russian Imperial Union-Order on the East Coast and Russian House "Rodina," joining the call of the International Social Committee "Bicentennial of the Tsar-Liberator," which organized the laying of wreaths at the Imperial tomb in Sts. Peter & Paul Cathedral from various countries around the globe where Russian people live, and encouraged similar events in other places in Russia and around the world. 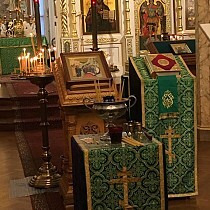 In accordance with a directive from the Synod of Bishops of the Russian Church Abroad, the pious sovereign was commemorated at the Great Entrance of the Divine Liturgy in St. Alexander Nevsky Diocesan Cathedral. The patron saint of the cathedral, which was founded as a wooden chapel in 1936, is the very same Heavenly patron of Emperor Alexander II: the Holy Right-Believing Great Prince Alexander Nevsky. 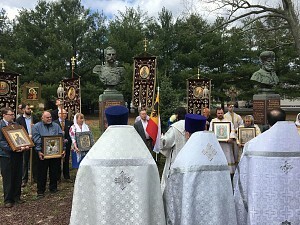 With the blessing of the cathedral’s rector, Metropolitan Hilarion, cathedral parishioners walked in procession to the Park of Glory after Liturgy, singing the Paschal troparion and irmoi of the Paschal canon. At the monument to the Tsar-Liberator, cathedral cleric Archpriest Boris Slootsky served a panihida, joined by visiting clergy. The ‘Royal Icon’ of Our Lady of Tikhvin, a personal icon of Tsarina-Martyr Alexandra, and the cathedral icon of St. Alexander Nevsky were also carried out for the procession. Afterwards, RIUO Representative on the East Coast of the USA Marina von Jahr laid a tricolor wreath at the monument in the name of the grateful people of Russia living abroad. In a brief eulogy, Fr. Boris expounded on the great feat of the Tsar-Liberator in abolishing serfdom, saying, "This was a huge breakthrough in the history of the Russian Empire. And for this, and not only for this, we are grateful to Emperor Alexander II." The title "Liberator" was also bestowed in honor of Russia’s military campaigns during Alexander II’s reign, when Russian forces liberated Romania, Serbia, Montenegro, and Bulgaria from the Ottoman yoke. 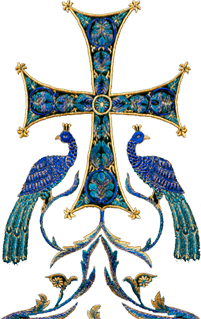 On the return procession to the cathedral, the inspirited faithful suddenly began to sing the "Prayer of the Russian People," the last anthem of the Russian Empire: "God Save the Tsar!" Instead of the traditional kutia, all were offered festal kulich and cheese pascha by the Union-Order during the Sunday luncheon in the lower hall of the Diocesan Center.